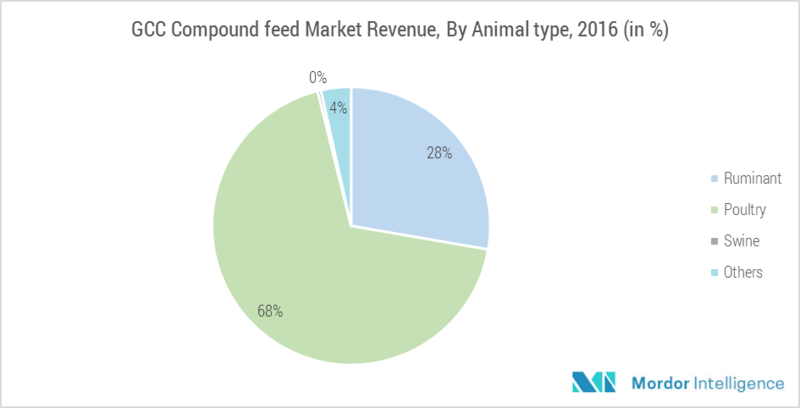 The GCC compound feed market is expected to register a CAGR close to 3% during the forecast period, 2018 to 2023. Feed is the largest and most important component for ensuring safe, abundant, and affordable animal proteins. This growth is largely fuelled by the rise in meat consumption, increasing disposable income, increase in mass production of meat, and recent livestock disease outbreaks. Rising concerns over the quality and safety of meat products have been making compound feed a better choice for livestock, when compared to the traditional fodder. The primary restraint identified in this report is the rising cost of raw materials, which is resulting in increased imports. The increased cost of feed ingredients requires an improvement in the feed utilization. R&D in Biotechnology has been the most feasible way to improve the nutrient content of the feed. There is a significant usage of biotechnology in animal production, especially for animal nutrition. The advancement of biotechnology has permitted the useage of non-toxic fungi, to improve fibrous feeds, like that of straw or poor quality roughages. Therefore, a wide variety of feed additives are known to modify rumen fermentation. They include components that help reduce methanogens, enhance propionic acid production, protein degradation, and improve microbial protein synthesis and inhibit protozoa. Among such additives, the commonly used supplements are antibiotics, microbes, and specific substrates like that of oligosaccharides. Also, effective enzyme preparations are produced in large quantities, at a more practical cost. Poultry meat production is expected to register a CAGR around 7% during the forecast period. The major reason for the surge in demand and consumption of poultry meat is the increased consumption of processed poultry in the GCC countries. It is identified that the poultry feed market had the largest market share of 68.3% in 2016, due to high slaughter headcount, resulting from increasing preference towards poultry, across all parts of the region. January 2018: Agthia Group launched AL AIN VITAMIN D, the world’s only Vitamin D water, at the International Water Summit. January 2017: Trouw Nutrition launched fortified Sprayfo formula with health support package. 11.13 Omani National Livestock Development Co.